Site and Date of Introduction: Intentionally introduced to UK from Japan as an ornamental in 1825 (according to Leslie Seiger, Nature Conservancy, Element Stewardship Abstract), from there made it to U.S. by late nineteenth century. 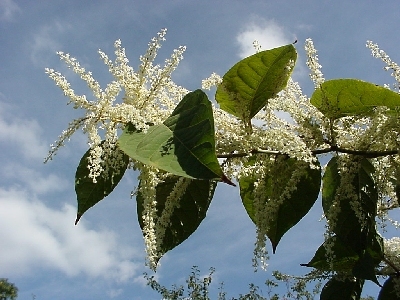 The Dutch botanist Houttuyn named the plant Reynoutria japonicain Japan in 1770, and it was not known until the late 1800s that Polygonum cuspidatum is identical (thus the disparity in scientific names). Control Level Diagnosis: High Priority. Extremely difficult and time consuming to eradicate once it is established. Hybridization has already occurred on a wide scale, and the potential exists for much greater interbreeding/evolution, making it even more difficult to control. It has been declared a noxious weed in several states. Because the leaves and stems fall thickly and take a long time to decompose, no other plants (except the new Japanese knotweed shoots) can grow in an affected area. Has the real potential to wreck havoc on native ecosystems. Control Method: Thoroughly digging out roots and stems takes years to succeed, if it ever does -- if even a tiny speck of stem remains, the plant will regenerate. It is vital to burn or otherwise properly dispose of the plant scraps -- it can ruin a compost pile. It takes a minimum of three years to get rid of it, either by cutting away to the stems and treating each stem with an herbicide such as Roundup or by covering the ground with black plastic and heating the soil to the point where the rhizome dies. The shoots can be eaten by grazing animals, but this doesn't eradicate the plant, only control it. Types of biological control agents (BCA) are being studied; it is known that there are many insects and fungi which control the plant's spread in its native range, so prospects are hopeful (according to the Japanese Knotweed Alliance).